I am a photographer specializing in extreme metal and horror. My home is Malmö, Sweden, but I am a frequent visitor of Copenhagen's rotten death metal scene as well as events around Europe. 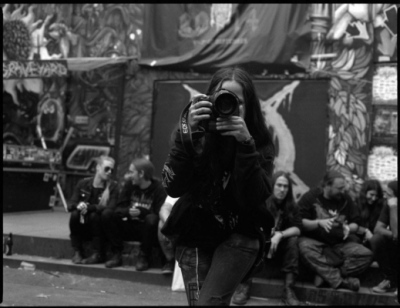 I've always enjoyed photography, art, the obscure layers of society, and last but not least - extreme metal. It therefore came natural for me to start shooting concerts and festivals (mainly those associated to death/black/thrash/grind). I'm also a horror novel devotee, and have been fostered by the works of Edgar Allan Poe, William Hope Hodgson, Howard Phillips Lovecraft, Sheridan Le Fanu, and many more, which I incorporate into my photography. Apart from this, nature is one of my greatest refuges and thus tend to end up in my photos as well. I am inspired by creative individuals that I meet, biological curiosities, Ambroise Bierce, Edgar Allan Poe, and of course death/black/thrash metal. Common "beauty" does not interest me. I also write about music, previously for Avantgarde-metal.com but nowadays mainly Slavestate.se. You can follow me on both Facebook and Flickr for continous updates. Please don't hesitate to contact me. All live shots are licensed under CC BY-NC-ND, i.e. you can share my concert photos non-commercially as long as you credit Septikphoto and don't make any changes in the photo.